Ships today if you order in the next 14 hours 21 minutes. 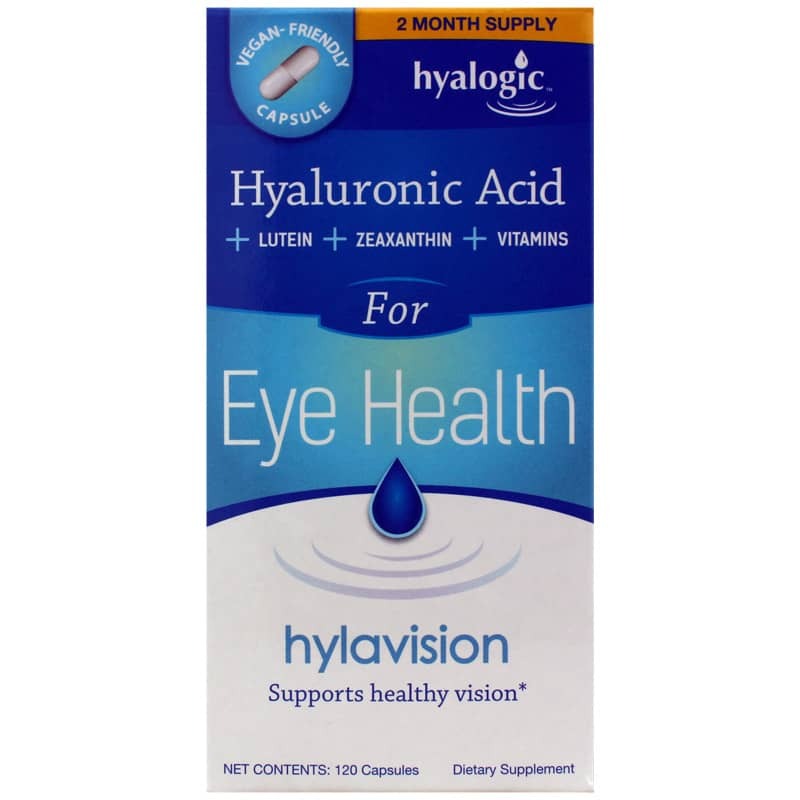 HylaVision Hyaluronic Acid for Eye Health from Hyalogic is a natural dietary supplement designed to support overall eye health. Vitamins A, C, E, and zinc are antioxidants that have been added to create a well-rounded eye and vision health product. Just like the rest of your body, your eyes need the proper nutrition to stay healthy and maintain those every day function that we take for granted. HylaVision may provide the daily nutrition your eyes need. Hyaluronic Acid makes up 95% of the fluid inside the eye. HA acts as a shock absorber for the eye and also serves to transport nutrients into the eye. HA plays a major role in maintaining the health of ocular tissues such as the cornea, the retina, and the vitreous fluid that fills the inside of the eye. It is been said that after the 5th decade of life, the eye has lost 50% of its ability to product the needed HA. HA supplementation can maintain proper eye health. Lutein and Zeaxanthin help filter out harmful light rays and support the retinal and macular health of the eye. Both Lutein and Zeaxanthin are antioxidant carotenoids and are a critical part of the macular pigment that protects the retina from degeneration. The density of the macular pigment is one measure of eye health. Arguably, lutein and zeaxanthin help maintain healthy cells and tissues in the eye, absorbing dangerous light waves and acting as antioxidants. Bilberry helps the eyes by promoting healthy eye circulation. Bilberry also works as a powerful antioxidant that may improve night vision, prevent eyestrain and build collagen. Vitamins A, C, E and Zinc are known for their powerful antioxidant properties and believed to play an important role in maintaining proper eye health. Contains NO: gluten, wheat, yeast, sugar, sodium artificial flavor, sweetener, preservatives or color. 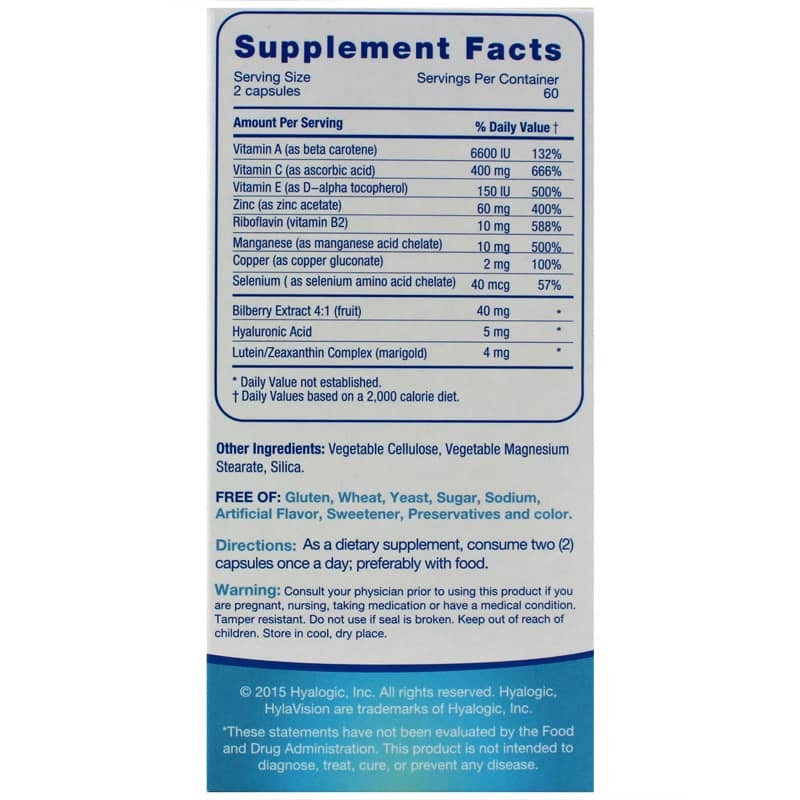 Adults: As a dietary supplement, take two (2) capsules once a day, preferably with with food. Do not take HylaVision if you are pregnant or nursing. If you are taking prescription medications, consult your healthcare professional before using this product. Keep out of the reach of children. 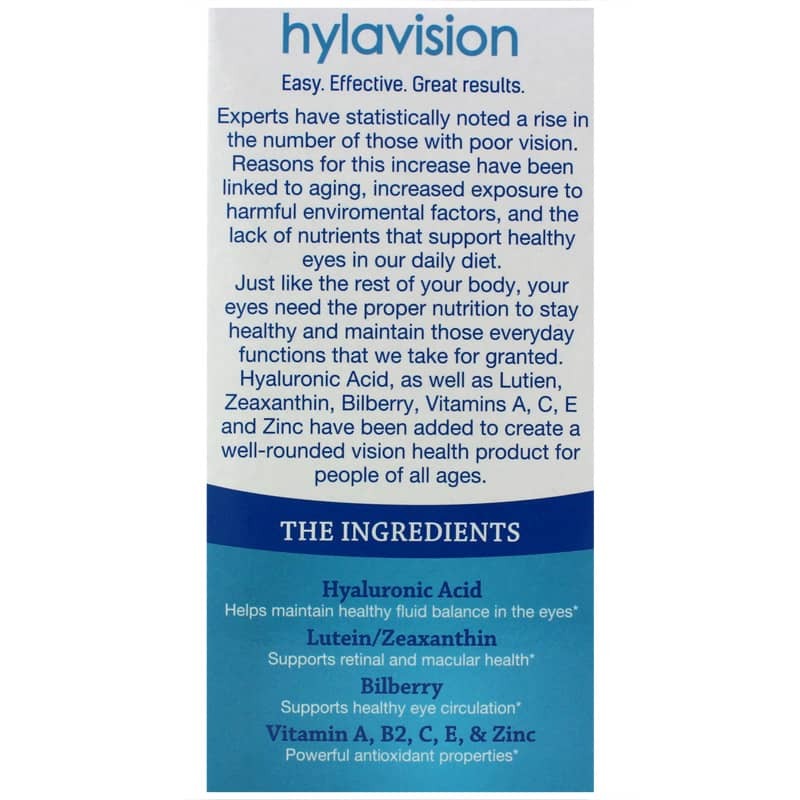 Hylavision Hyaluronic Acid is an excellent product. Seeing an inprovement in our vision after only 2 weeks! Wish we would have taken this years ago. I've been using Hylavision for awhile now and I can emphatically say it has done wonders for my dry eye problem! I highly recommend this product!